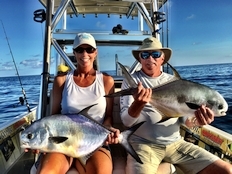 World class Florida fishing charters, Boca Grande tarpon fishing charters, and Tarpon fishing charters on the flats and backcountry of Tampa Bay, Boca Grande, Clearwater, St Petersburg, Tarpon Springs, and Charlotte Harbor. 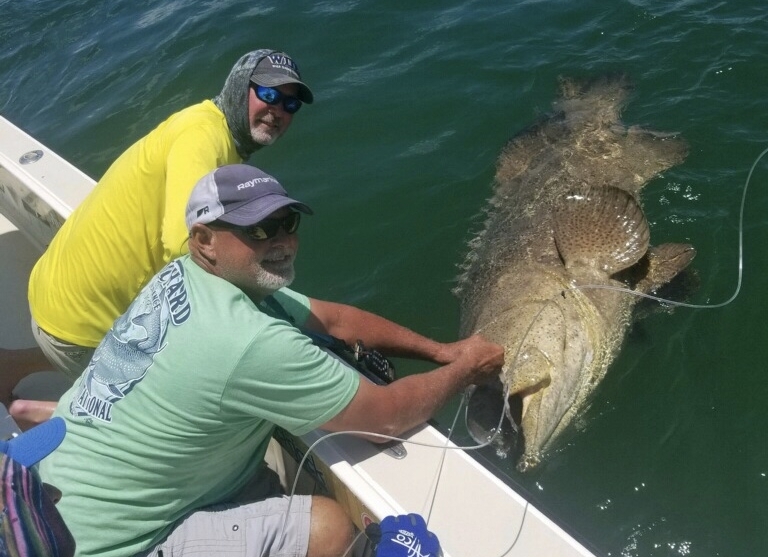 Join Captain Jeff Hagaman for a tarpon fishing charter or a light tackle flats, and back country Florida fishing charter for tarpon, snook, redfish, permit, trout, cobia, sharks or goliath grouper. 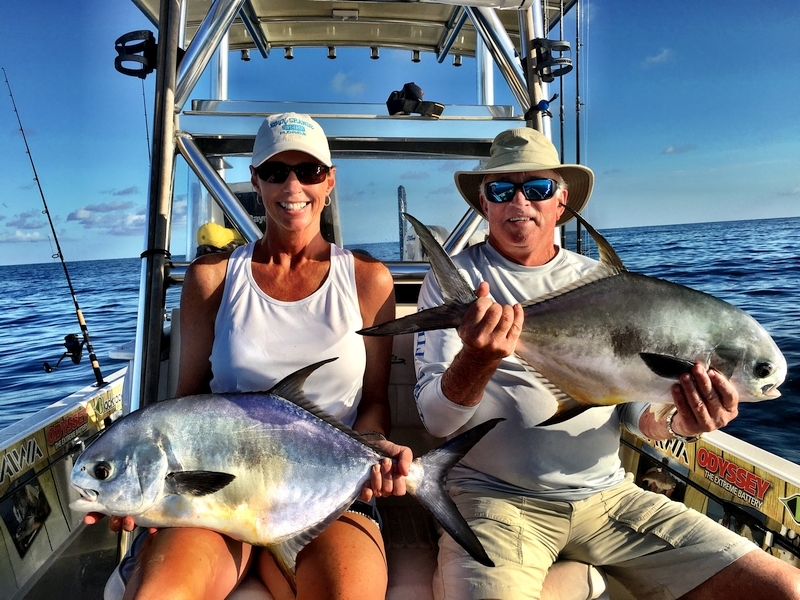 From Tampa Bay to Boca Grande, Captain Jeff is an award-winning Florida fishing guide who specializes in light tackle fishing charters in the shallow waters of Florida's Gulf Coast. Jeff will take you to some of his best fishing spots to ensure that you have a successful day on the water. Anglers of all skill levels and fishing backgrounds are welcome. 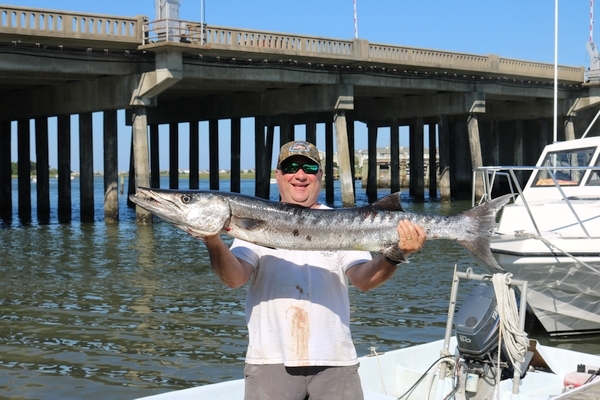 We target what�s biting, but if you�re looking for a specific fish, give Jeff a call so he can get you hooked up. Whether it�s fishing the fertile flats of Clearwater's St. Joseph Sound with a top water plug, jig fishing the rich grass flats of Tarpon Springs, live bait fishing a giant school of redfish in Tampa Bay, or sight fishing for tarpon along the beaches of St. Petersburg, our area offers a great variety of fishing opportunities and locations. To take advantage of all the fishing possibilities and customer requests, I keep my boats on trailers and take you to the best fishing available at the time of your charter. I use many different techniques and fish both artificial and live bait. Our inshore waters are home to many large, hard fighting game fish. Snook, trout, redfish and tarpon are our primary target species, but we also have excellent fisheries for cobia, permit, goliath grouper, sharks, king mackerel, spanish mackerel, and jack crevalle. See Our Fish and Their SeasonsTry fishing for a West Coast Grand Slam, a snook, trout, and redfish in one day. And when conditions are right you can even catch the ultimate Super Grand Slam by adding a tarpon. Florida tarpon fishing provides anglers with thrilling head-shaking runs and tarpon are known for tail-walking and jumping in the air in an attempt to throw your hook. A Boca Grande tarpon fishing charter is a truly unique experience and a �Must Do� on a fisherman's wish list. Boca Grande, on Florida's Gulf Coast, is the Tarpon Capital of the World. Every spring and summer, tarpon migrate to the beautiful waters of Boca Grande Pass and Charlotte Harbor in greater numbers than anywhere else in the world. The spectacle of this congregation of magnificent tarpon is one of the natural wonders of the marine world. To observe this event is a thrill in itself but to catch a giant tarpon is the ultimate fishing experience. Capt. Jeff guides for giant tarpon fishing at Boca Grande and Charlotte Harbor from April through July. 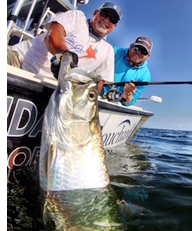 If you�re looking for hard fighting action, Tarpon fishing in Boca Grande is a perfect fit. 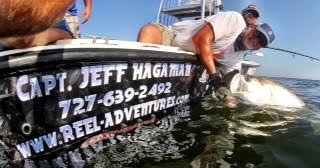 Join Captain Jeff for a tarpon fishing charter aboard one of his custom rigged tarpon boats. 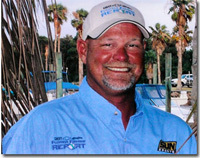 Captain Jeff is a highly respected and nationally recognized charter fishing guide. He is one of only three Elite Guides for Berkley Fishing tackle in Florida. Because of his knowledge and experience fishing the water of the Gulf Coast he was chosen by Fox Sports TV Network as the the regional expert for his area of the state for their Emmy winning "Chevy Florida Fishing Report". He appears four times a week with fishing reports for his area. His expertise and friendly, open manner have led to many appearance on The Outdoor Channel, North American Outdoors and Sun Sports Network. But the bottom line is that Captain Jeff knows his stuff, is just plain fun to fish with, and will do what it takes to make your fishing charter a very memorable experience. About Captain Jeff. “Many Saltwater fishermen in Florida fancy themselves great anglers and some, actually are at the top of their game. Only once in a long while does an angler come along that other fishermen envy and even boast about. One such gentleman is Captain Jeff Hagaman. Finished among the top 4 teams in the Yamaha Team of the Year competition seven times. The “Good Old Days” of Florida Gulf Coast Fishing are......NOW!! 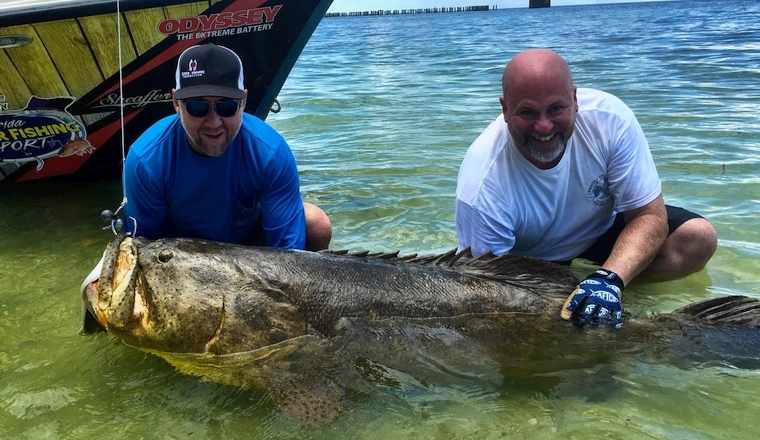 The conservation and environmental efforts of the citizens of Florida have brought back the "Good Old Days” of sports fishing on the West Coast of Florida. Our water quality and fish populations are better than they have been in decades. The many bays, flats, rivers, marshes and barrier islands of the Gulf Coast of Florida offer you an opportunity to battle large hard fighting tarpon, snook, redfish, permit, trout, cobia, goliath grouper and many other gamefish. 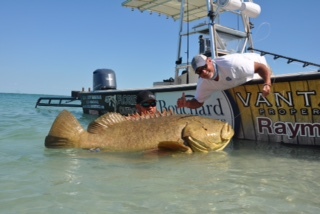 Large fish on light tackle on the shallow water flats are the ingredients for exciting sight fishing with drag screaming runs and spectacular jumps. Check out “Our Fish and Their Seasons” for more information on Tarpon, Snook, Redfish, Permit, Trout, Cobia, Goliath Grouper, and the other game fish you will encounter on a Florida fishing charter.